Toya dropped this link off on the FB page, and I thought it might make for interesting discussion here. Meet Drew, a personal trainer with a rather insane idea: hes going to make himself obese so he can learn what its like to come down from it all. As someone who has been there, Id be lying if I didnt admit that what hes doing is terrifying to me. I know what it takes for an individual to get 70lbs overweight – as Drew currently is now, see photo above – and considering what hes risking physically as well as mentally and emotionally, I worry for him. The link is an interview of Drew, sharing a bit of his thoughts on his journey beyond obesity. Its worth the click. Hes going from having a relatively fit lifestyle to the standard American diet (ironically, referred to as SAD), and in turn his blood pressure went up. A big part of this is those unhealthy foods he mentioned as being a part of his diet: sugary cereals, granola bars, juices, white breads, white pastas, sodas, crackers, chips, frozen dinners, processed mac-n-cheese. All high-refined-carb foods loaded with salt. His quote: [After I eat those foods,] I feel like crap later on and I get hungry again and crave those same foods. Sounds familiar. His quote: I definitely feel addicted to these foods. In the beginning, I didnt like soda but now I cant go a day without, otherwise Ill get [withdrawals.] Ill be extremely interested in how he gets beyond this issue, because for a lot of BGG2WL readers, the withdrawals from what their bodies are used to is often the most difficult part of converting to clean eating. Drew’s story will be blogged at Fit 2 Fat 2 Fit. Your thoughts? I know Ill be paying close attention to this. I think he’ll have a bit of an easier time because he’ll remember what it is to be fit, and know what a runner’s high feels like. Still, it’s an interesting experiment. He’s a personal trainer and knows what it takes to lose weight and get back in shape. 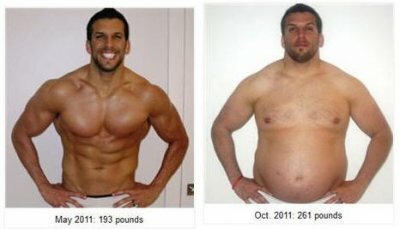 I cant believe he wld go frm a 6 pack like that to that just to see what’s its like. I dont think I wld ever want to go backwards once I get to my goal even if it’s to see what its like. I wish him the best!! I just saw the first video on the front page of his blog. He kicks off the experiment by eating a dozen donuts. Ok, maybe he understands how unrealistic that is and he’s going above and beyond to really pack on the pounds, but it actually offended me. I am 335 pounds and I have NEVER eaten a dozen donuts! I might eat three, and feel terrible about it. But usually, on the rare occasion that I’m surrounded by donuts, it’ll be more like 1 or two. It just bothers me because I feel like this is how fit people see me. They assume I’m stuffing donuts down my throat. I really don’t know how I feel about this guy. If he’s really trying to understand what it’s like, then I’m impressed. If he’s doing it just to prove that he can lose the weight in six months, so it must not be that hard for someone whose been overweight their whole life, then I’m pissed. This is like the “natural” women who relax their hair and transition back to natural to teach other women how to go through the process. Except your hair wont kill you. This also ins’t unlike the guy from Supersize me and what he did. My concern is that even though he plans for this to be temporary, can there be any permanent damage done? My mom was diagnosed with Type II diabetes, for example, and even losing 150lbs didn’t help. Weight loss doesnt immediately cure all cases of high blood pressure either. I didn’t develop HBP until after my surgery, which was odd as hell for me. My other concern is the “Hey if I can do it so can you” mentality that he seems to be promoting. I’m glad he identifies the struggles that the average person deals with emotionally and physiologically, but I have some serious issues with that whole idea that if one can do it everyone can. Even with my own journey, I tell people they have to find their own path. When it comes to exercise, I’m like hell yeah if I was 406 lbs once and finally go moving, you probably can too, but my discussions also examine the nuances of exercise culture and our aversion to it. I’ve seen this before. He did this experiment last year and published a book about it in June 2012. I sort of feel like it is gimmicky and could lead to lots of “he did it, so can you!” comments. But, I think he discovered a lot of things that correlate with the experiences of people who have been overweight for a long time. Namely, his food addictions. So, I think it could be positive. I still don’t think it is the same as a person who has been overweight for years. I gained weight after puberty and most of it during/after college. I know my experience is still very different from someone who has been overweight their entire lives. I thought I was tripping thinking he did this already. Whew, thought I was crazy. I don’t get why he’s doing it again. That can not be healthy. I don’t know what else can happen. He already knows how crappy he started treating his wife and kids, how lethargic he became and how his body had changed after he lost the weight. Sounds like a gimmick to me too. I get SO tired of the “If I can do it, you can do it”. We are all different in chemical structure, body, and genetics to say the least. If he wants to do this to prove a point to himself, let the man do it. He has the tools to recondition his body and mind. From what I see, age has nothing to do with a person choosing to live a fit lifestyle. People who are considered “healthy” by appearance fall dead too. So then what?? I think there is some merit to this experiment. I’ve worked with many different trainers for various sports and for weight loss over the past 25 years. You can tell the difference between a trainer who’s always been thin/fit or is naturally skinny and someone who’s had to lose a significant amount of weight. The latter is a bit more sympathetic to your weight-loss journey, the former…not so much. You know the difference between a teacher who just “gets” math and doesn’t understand why you don’t get it too, and the teacher who struggled with math as a kid and works to help you understand the subject. That’s what I want: trainer who’s been “through the fire”, one understands what you mean when you say “i just want a cookie!”. Ya know? @Molly, I’m not sure why you’re offended. So you haven’t eaten a dozen doughnuts and you’re 335 lbs…OK. Substitute your addiction. A whole pizza? Bucket of wings? An entire Entenmann’s Louisiana Crunch cake? I’m 245 lbs. I’ve eaten a quart of ice cream in one night, effortlessly. Mounds of mac and cheese…no problem. Congratulations if you don’t have a addiction/trigger food. But most of us do. He lost the weight and got back to his pre weight gain stats. That was a year ago. I can’t find anything more recent. He said at the conclusion of his experiment that he had more of an understanding of the emotional and mental aspects of weight loss. Obviously, he had a very fit and healthy starting point to get back to. For people who have been overweight their whole lives, they don’t have that. It’s difficult to even imagine that you can ever get there. That being said, I appreciate what he was trying to do…to understand what it’s like for his clients. But now I’d like to hear how the last year has gone for him. Is it more difficult to maintain his level of fitness. After a year, does he still crave the sweets and carbs? The “success” story doesn’t interest me as much as the story of how that success is maintained. Didn’t he write a book about his experiences? Wow, this is so interesting! Kuddos to him to have the desire to really understand where his clients are coming from.